PROPERTY DESCRIPTION: 308+- acres northeast of Newton, Kansas in Marion County. 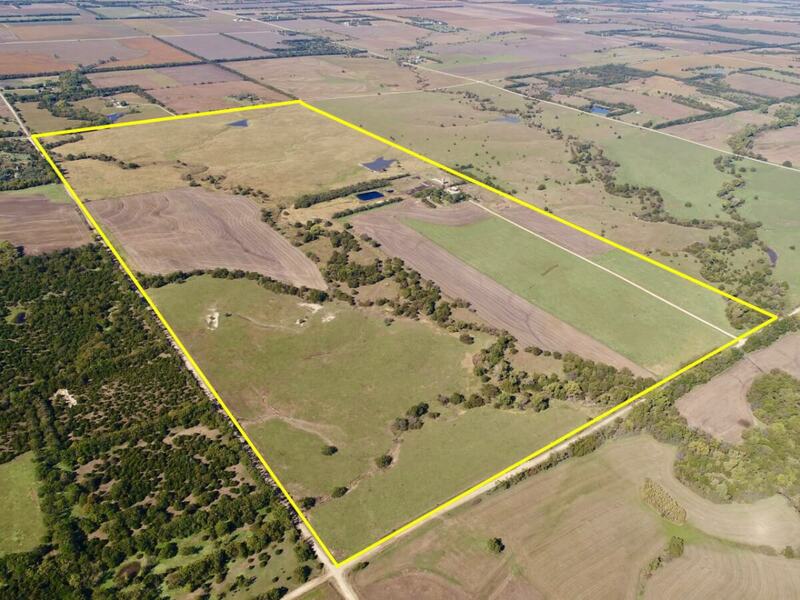 Great opportunity to purchase a property already setup for both farming and livestock operations. This land offers a nice balance of tillable farm ground, native livestock grazing pasture, timber, and improvements. A creek runs through the property offering live water a good majority of the year. The tillable, live water, timber, and pasture make this a perfect place for wintering livestock. Nice combination of agriculture and recreation with abundant wildlife including Kansas Whitetail Deer and Turkey, both of which are frequently visible on the property. If you are looking for a future headquarters, backgrounding facility, or a starter yard, this property has many of the necessary infrastructure already in place. IMPROVEMENTS: Wonderful location for new home construction with beautiful views and mature trees. There is a red iron frame metal building with a concrete floor, other misc. utility buildings, an old silo, and livestock pens. The 1 1/2 story farm house was built in 1910. It has 3 bedrooms, 1 1/2 bath, and a partial basement. Some areas of the house have been updated, but it will need some work to be brought back into average living condition. Other features include concrete feed bunks, tub, and bins.. Water is provided by a rural water meter, which will transfer to the buyer at closing. There are multiple automatic waterers throughout the property. LEGAL DESCRIPTION: The South Half of Section 29, Township 21 South, Range 02 East of the 6th PM, Marion County, Kansas. LAND LOCATION: From Walton, 3 Miles Northeast on US HWY 50 to East Lake Rd, 3 Miles North to 90th, 1 Mile West to Holly, 1/2 Mile South to the Property. Common address is 843 Holly, Peabody Kansas 66866. 2017 REAL ESTATE TAXES: $2852.84. TERMS: Earnest money in the amount of $50,000 will be due at the conclusion of the Auction with the balance due upon Sellers submission of merchantable title and closing. Closing date shall be on or before January 4, 2019. Closing fee and title Insurance fee will be split 50/50 between Seller and Buyer. Selling subject to easements, restrictions, roadways and rights of way. This property is not selling subject to financing or inspections. Interested buyers need to view the property prior to the date of the auction and have financing available and any inspections performed prior to bidding. All pertinent information is available upon request. All announcements made the day of the auction take precedence over any other announcements or printed material.